February sometimes feels like a gloomy month. The overcast weather and short days give you the blues, and those blues make homeschooling seem like a chore. You can reinvigorate your homeschooling passion simply by making a few changes. Not only will these changes uplift your spirit, they will also give you new ways to practice your homeschooling. After all, change is good. Since you’re the boss, you can experiment with different ideas that you’ve never tried. That’s the beauty of homeschooling, it’s dynamic — not rigid like traditional school settings. 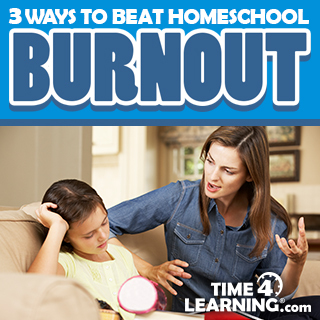 So don’t get down on yourself, beat the homeschool burnout blues with these three fun tips. You may be feeling a bit cooped up during February. If the weather is cold, it’s natural to just keep the children indoors, especially with the flu and other cold bugs that make people sick this time of year. But a shot of fresh air will do wonders for your spirit. Just bundle up and take a stroll in the park or simply go to the mall or library. Changing the setting inspires many children and homeschool parents. You’ll find that a break in your schedule for some fun activities often helps children concentrate better on their studies. It’s almost like a reward. Sarah, a homeschooling mom of three children, takes her children to the library for free programs such as beginner computer classes and group reading. She says they look forward to getting out of the house even if it’s for an hour or so a day. If you or your children aren’t happy or excited with your curriculum, start exploring new options. There certainly are a lot to consider. Simply do a quick internet search, go to a homeschool convention or chat it up with other homeschooling parents and see what they’re using. One good idea is introducing a web-based curriculum. Online programs can provide stimulating tools for your children and you too. They sometimes resemble video games rather than a typical curriculum. They include characters and lessons that your children relate with – kind of like a play pal who’s doing their homeschooling lessons with them. Many parents appreciate this option because web-based tools offer scheduling, automated grading, and even detailed progress reports, which your state may require. This helps cut down on the administrative duties which can sometimes become overwhelming. As a homeschooling parent, you are responsible for your children’s education and that can cause stress. The burden often makes parents over plan and set goals that are not realistic. If you feel burned out because there is just so much to do and not enough hours in the day, take a deep breath and be honest with yourself. You’re not a superhuman with otherworldly powers. Focus on just a few things a day. Set limits for yourself and your children — you won’t get everything done in one day or even one week. The education process takes time. Look over your schedule. Is it jam packed? Are you falling behind? If so, eliminate the extras. You should only be homeschooling for four to five hours a day, sometimes even less depending on your student’s age. Many homeschoolers use organizers so their day is clearly mapped out, while others use online tools which help with scheduling lessons and planning the day. Find out what works for you. Stressing about every little detail only fills your days with more stuff. And if your to-do list keeps growing, start crossing off the “nice-to-haves”. These are just a few key ways to beat the burnout blues. If you meet with other homeschoolers, talk with them about how they keep themselves and their children motivated. They may have good ideas, but don’t get frustrated if they don’t work for you — every parent and child responds differently. Find out what works for your household and keep it simple. Soon, you and your children will be chugging along! Previous Post Help! My Child Doesn’t Want to Homeschool Next Post I Wasn’t Good at School, Can I Learn How to Homeschool?